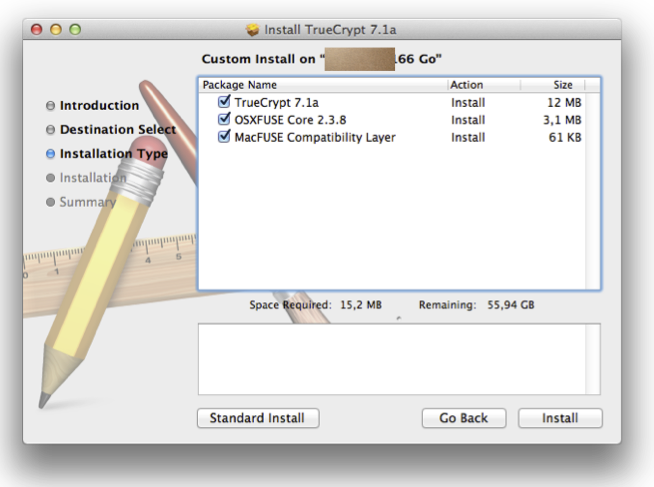 After upgrading to Mountain Lion, I can't mount any volumes with TrueCrypt 7.1a anymore. After typing in the password for the volume, an error message is shown, stating that the fusefs kext can't be loaded. com.apple.kextd: Failed to load /Library/Filesystems/fusefs.fs/Support/fusefs.kext - (libkern/kext) link error. kernel: Can't load kext com.google.filesystems.fusefs - link failed. kernel: Failed to load executable for kext com.google.filesystems.fusefs. kernel: Kext com.google.filesystems.fusefs failed to load (0xdc008016). kernel: Failed to load kext com.google.filesystems.fusefs (error 0xdc008016). Do I need to update MacFuse or TrueCrypt to make this work again? It turned out that this was related to running a true 64-bit kernel instead of a 32/64-bit one. After installing this, I reopened TrueCrypt and was then able to mount the volume. and does run on Mountain Lion. Not the answer you're looking for? Browse other questions tagged mountain-lion kernel truecrypt kernel-extensions . NTFS-3G unmounts NTFS partitions because it “did not receive signal in 15 seconds”—what signal? Why is FAT16 limited to read-only with TrueCrypt on Snow Leopard? Is TrueCrypt compatible with FUSE for OS X and SSHFS?